ShopSocially's highly acclaimed Share-a-Purchase app helped a leading online provider of unique personalized gifts to leverage the power of brand ambassadors and achieve a 34.69% conversion rate. ShopSocially’s apps have helped us achieve unbelievable results when it came to reaching out to new clients. - Yianni Chamilothoris, Director of Marketing at MonogramOnline. 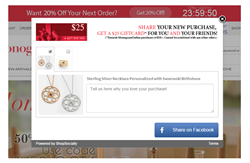 MonogramOnline started using ShopSocially’s Share-a-Purchase app to allow its customers to share their purchases with their friends via email, Facebook, Twitter and Pinterest. It captures one of the most opportune moments of customers’ delight, i.e. just after the purchase, and offers them incentives in return for sharing their shopping experience with their friends and family via social networks. As a result, the Share-a-Purchase app increases the buyers’ likelihood of making repeat purchases while allowing brands to expand their reach through social media. To further maximize the effect of clients’ shared posts, the app allows vendors to automatically embed these on their trending products pages. MonogramOnline also embedded the Product Stories app, which encouraged their buyers to share stories and sentiments behind their purchases. These product stories acted as a social proof on MonogramOnline product pages, resulting in a conversion rate of 16.80%, increasing buyer confidence in purchases, and boosting site’s rankings on search engine results. From humble beginnings as a jewelry manufacturer, MonogramOnline has expanded its store to provide a large selection of customizable gifts ranging from accessories to kitchenware and all the way to school and office supplies. Currently boasting over 2,500 custom items, the online store promises a unique customer experience by combining traditional, high quality craftsmanship, modern technology, and creative marketing. For more information on the online retailer and its offerings, visit http://www.MonogramOnline.com. ShopSocially is a premium, SaaS-based, social, referral and loyalty marketing platform for businesses. Leading brands like Crabtree & Evelyn, Dressbarn, Zipcar, Ulta, Beretta etc. are using the ShopSocially platform to enable referral marketing, visual commerce, customer loyalty, social login, social gamification and other such programs on their site. ShopSocially has been consistently driving word-of-mouth promotions via social for thousands of brands and delivering positive social ROI for their social media efforts. ShopSocially has won several awards and has also been featured by Facebook in a Social Commerce case study. Launched in Oct 2010, ShopSocially is a privately held company in Santa Clara, CA. For contact information, please visit http://shopsocially.com/platform/request-a-demo.html.